Steam power will soon be a reality once again at Mid-Continent. As part of the Steam-Readiness Program, certain items that do not fit the focus or needs of the museum will be offered at auction. 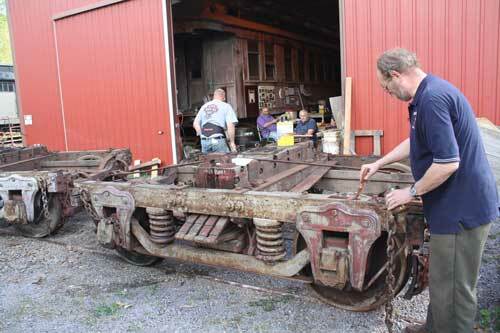 Open House – May 1, 2015 — 10:00 a.m. to 3:00 p.m.
Auction – May 2, 2015 — 10:00 a.m.
A HISTORICAL EVENT IS HAPPENING — A NEVER-BEFORE OPPORTUNITY TO BID ON ITEMS FROM THE MID-CONTINENT RAILWAY MUSEUM. Final listing of items may change due to logistics and other considerations. TERMS: 10 % Buyers Fee. Online bidder’s 13% buyer’s fee, 3% Convenience Fee for all Credit / Debit card (Master, Discover & Visa Cards) payments. No Tax Cash or Check, Positive Photo ID required, Bank letter of guarantee for all rolling stock paying with a check. $50 Fee on all Returned Checks. Everything sold AS-IS. No Refunds. Announcements made the day of auction have precedence over prior advertisements. All items must be removed day of sale, except rolling stock has 30 days and must be prescheduled for pick-up. Here is a unique opportunity to be a part of our working railroad by joining the Mid-Continent Railway Museum Operating Department . We are now accepting applications for our training school beginning on April 18th. 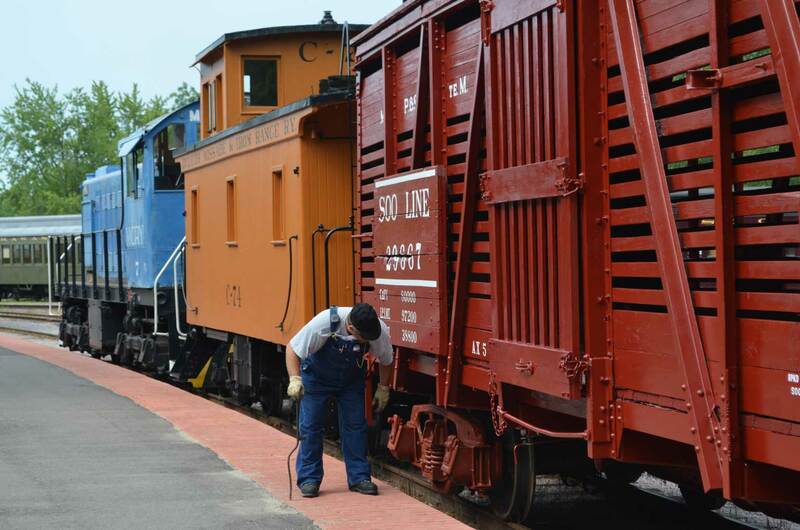 During your four day training (two successive weekends) you’ll learn the basic operating and safety rules in use by Mid-Continent Railway during classroom sessions and then working outside with the museum’s equipment during the hands-on portion. 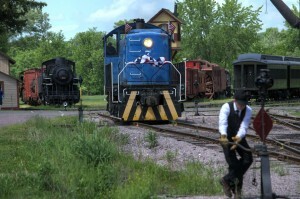 Only Mid-Continent Railway Museum members ages 18 and above and in good standing are eligible. Four days of in-classroom training is required followed by individually scheduled student trips (job shadowing) and a final qualifying test. Persons qualified on other railroads are not exempted from the required training. Limited class space available and signup is offered on a first-come, first-serve basis. Keep in mind that some aspects will require you to be physically capable of but not limited to performing such tasks as throwing switches, replacing coupler knuckles, minor rolling stock maintenance, climbing onto and off of equipment, and working in all types of weather conditions. Do I have to to know a great deal about trains and railroad history to enroll? Yes, but all new train crew volunteers must start as trainmen. The training program last 4 days (April 18-19, 25-2, 9am-5pm). This must be followed up by completing several days of independently scheduled student trips prior the end of the season. Within the Mid-Continent Railway Museum collection of equipment we arguably have one of the better collections in the country for wooden passenger cars. Each wooden passenger car has its own significance and importance to the collection. 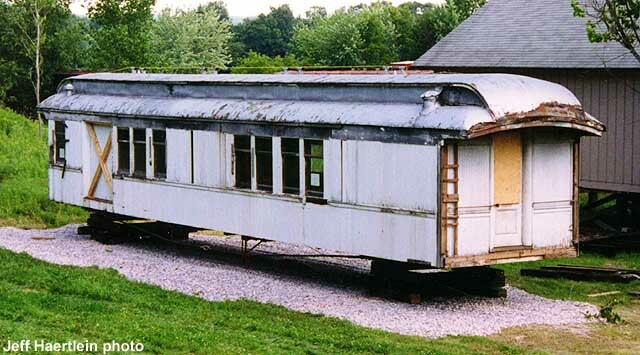 One particular car stands out as being the most historically significant car to Mid-Continent due to it meeting all of the criteria for our collection pieces AND it operated on a railroad in Sauk County, less than 25 miles away from North Freedom. This car is the Cazenovia Southern combine (ex-Mineral Point & Northern). Read more about Cazenovia Southern No. 2 (ex-Mineral Point & Northern) by visiting it’s listing on our Equipment Roster page. The car arrived at North Freedom as a car body only (no trucks, draft gear, platforms, etc.) on July 14, 1999. The car is largely unknown due to the fact that it is sitting under a tarp next to the freight house and northeast of the MCRM office. Due to the importance and significance of this car it is surely deserving to be restored to operating condition. In order to do this the car will have to wait its turn to be routed through the MCRM Car Shop, not to mention raise the necessary funds for restoring the car. While it will be a number of years before the Restoration Department can tackle this restoration project there is a call for help RIGHT NOW that will position the car to be completely restored in the future. Due to the fact that the car is a body only we are desperately in need of the appropriate passenger car trucks, draft gear, brake equipment and related iron parts to restore this car. If Mid-Continent had to reproduce these items it would cost hundreds of thousands of dollars. We’d certainly prefer to not do this so we have been constantly been looking for opportunities to acquire the necessary parts from another car. With the recent passing of Don Lind (owner of the Minnesota & Western RR, Annandale, Minnesota) it came to our attention that his collection of rolling stock was up for sale. Within the collection there were three heavily deteriorated passenger cars that could be sources for the parts we are in need of. 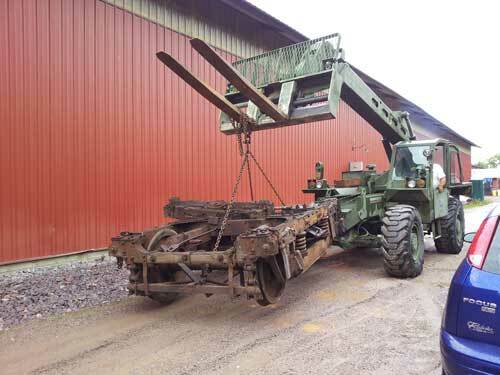 In late April Mid-Continent members toured the site and confirmed that the necessary and appropriate parts for the Cazenovia Southern combine are available. 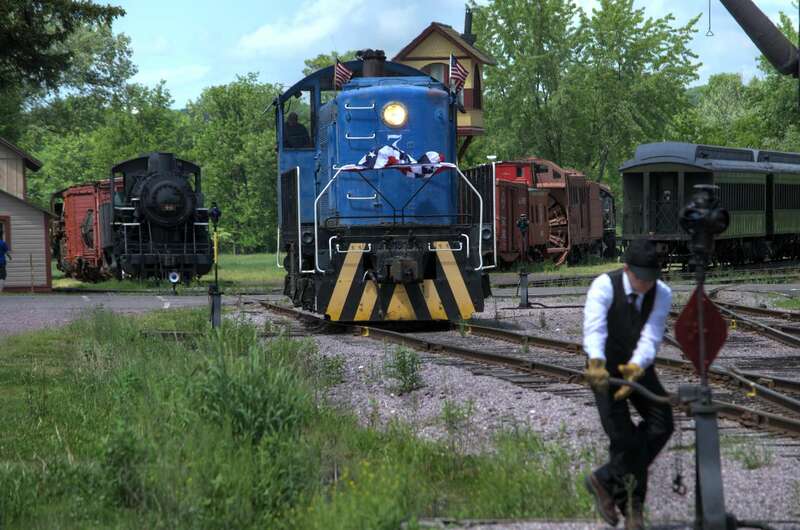 Since then a price has been agreed to with the seller and a plan to remove, load and transport the parts from Annandale, Minn. to North Freedom has been initiated. Our mission has been accomplished with the generosity of donors and the hard work of Mid-Continent Railway Museum volunteers. The campaign to salvage items for use on the Cazenovia Southern coach-baggage car and other equipment has been a great success! The goal of $10,000 was reached and exceeded, totaling $10,250 with the help of 18 contributors. In terms of volunteers, Dave Wantz’s help was very significant as he made some 14 trips to the Annandale, MN site to assist with site preparations and parts removal. Dave was assisted many times by Minnesota resident and Mid-Continent member Chuck Ham. Racking up the most miles driven to help on the effort was Richard Potthast who made five trips to the Annandale site. Driving over 3,000 miles (total) as he hauled parts back to Mid-Continent. The trucks and car parts purchased from the Minnesota & Western site are now safely and neatly stored away on the MCRM property. From all aspects, this effort has been a success and a tremendous boost to the eventual restoration of the Cazenovia Southern car. The car must still wait in line for a turn in the Car Shop and further fundraising will be needed to pay for additional materials to complete the project but this is crucial first step. 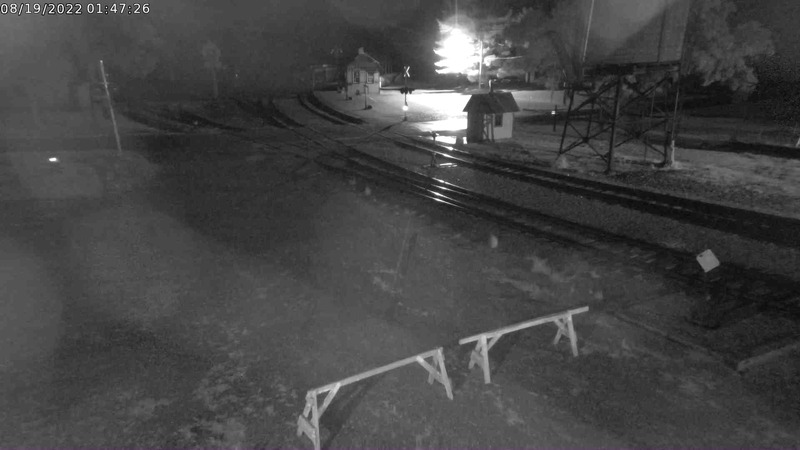 The quick actions of museum leaders, the generosity of donors, and the dedication of volunteers all allowed Mid-Continent Railway Museum to seize this opportunity and will pay dividends many times over when restoration of Cazenovia Southern No. 2 begins in earnest. If you wish to contribute toward the future restoration of Cazenovia Southern No. 2, please visit the donation page and write “Cazenovia Southern #2” on your check’s memo line or on the printable donation form. Alternatively, consider donating to the broader “Wood Car Restoration Fund” to help speed along current restoration projects in the most efficient manner possible. 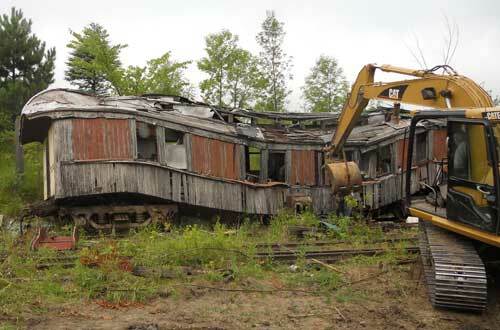 Collapsed railcar at former Minnesota & Western site being dismantled for parts. Volunteer Richard Dipping applies linseed oil to protect the 7-ft (wheelbase) truck salvaged from Wisconsin Central No. 331, a car formerly in the Minnesota & Western collection. These trucks will ultimately end up underneath Milwaukee Lake Shore & Western No. 63, replacing the inaccurately sized trucks currently used. One of the two newly acquired 8-ft trucks from the Minnesota & Western site is carried into storage at Mid-Continent Railway Museum. This item will be repaired and put to use under Cazenovia Southern No. 2 when restoration of that car is completed. No. 2 did not have it’s own trucks when it was donated to Mid-Continent Railway Museum in 1999. You can help restore Chicago & North Western No. 1385 to service. How? By sharing any images you control the rights to, moving or still, in nearly any format. 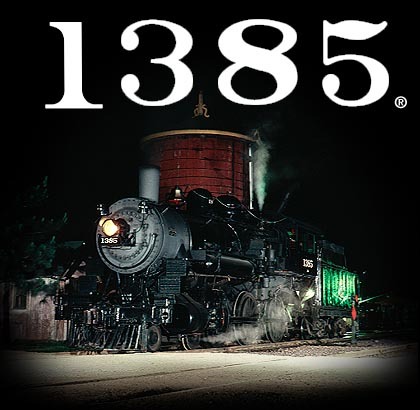 Mid-Continent Railway Museum’s 1385 rebuild Task Force is looking for your help in creating displays for public viewing showing the history and life of Mid-Continent’s most famous locomotive. We are interested in all types of visuals, posters, postcards, photos, video, movies (yes film), paperwork, blueprints, C&NW materials – any and all items that could be connected to the working life of the 1385. We want to tell the story of the life and use of this engine both on the C&NW and at Mid-Continent Railway Museum. Your images will help tell that story. Graphic Designer and MCRM member Randy Long has offered to scan and then return these items. He can turn just about anything; prints, slides, negatives (color and B&W) and printed materials, into a digital image and can photograph other artifacts that you may have. Please Note: phone number is for Long & Associates Creative Services. For general museum inquiries, please use the phone numbers provided at left. 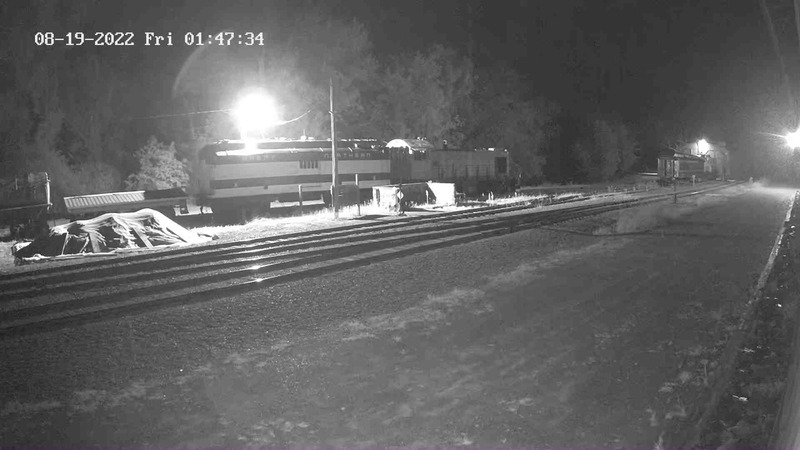 The Task Force would like to thank you in advance for your help and support in bring Mid-Continent Railway Museum’s and one of the Midwest’s most famous locomotive back to life. With your help you’ll soon be able to once more hear that Whistle On the Wind. For a brief history of C&NW No. 1385, visit the Equipment Roster page. For restoration updates, visit the Steam Status page. We have compiled a list of some of our favorite issues of the Mid-Continent Railway Gazette since the first issue in 1968. Start by reading a brief history of the publication. Also check out the Mid-Continent Compendium, the 100+ printed guide to all things Mid-Continent.